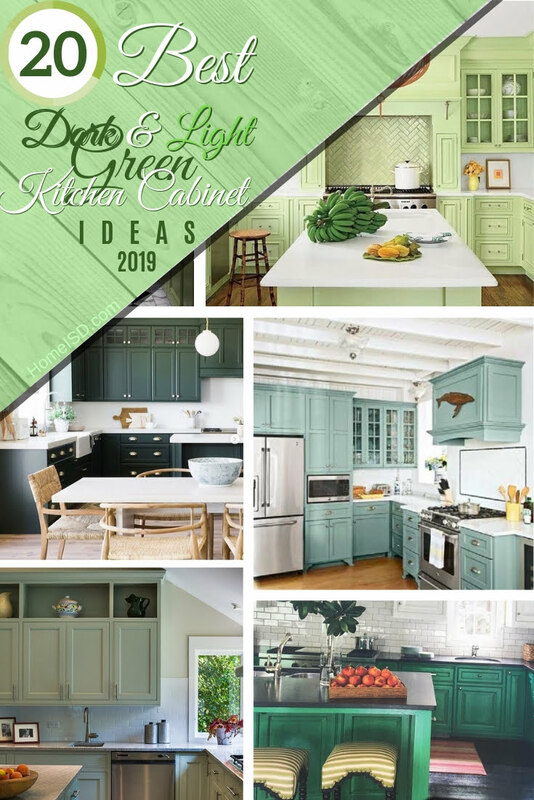 Looking for green kitchen cabinet ideas to hype up your decor in 2019? 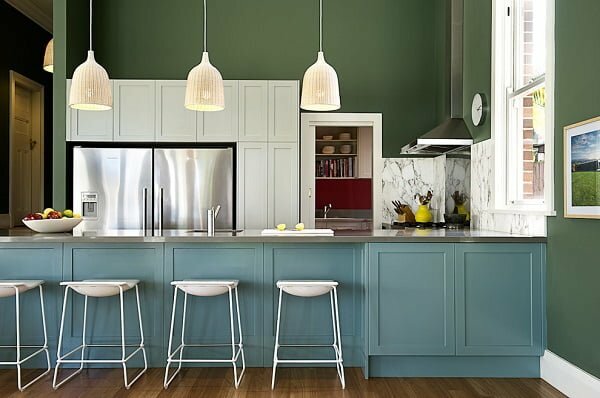 Here are some of the most creative uses of dark and light green in kitchen design for your inspiration. 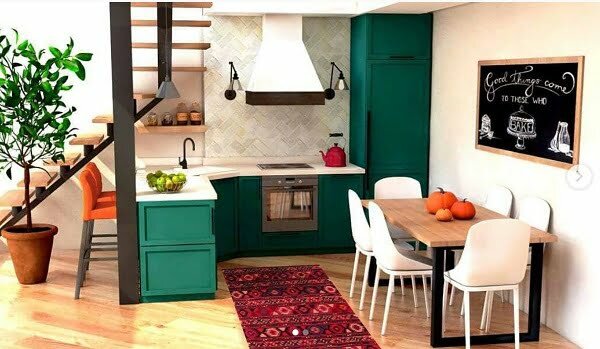 Green has been all the hype in recent years, more and more people are embracing it in their kitchen design and decor. 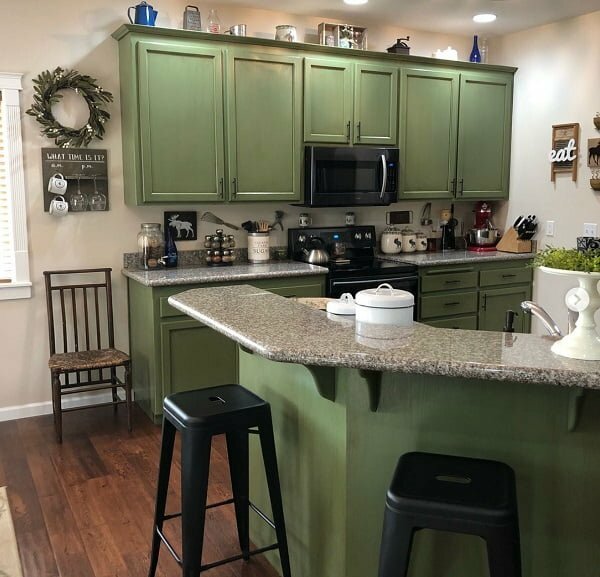 Green kitchen cabinets can not only make a contrasting accent in the interior design of the space, but they can set the tone to your entire decor. There are so many green paint options to choose from, and they all have a very different effect. 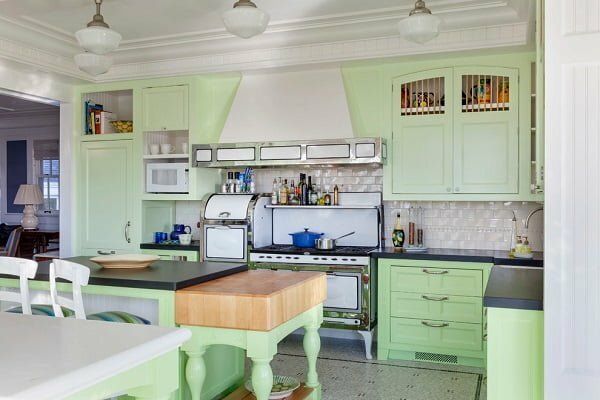 So where do you even start when trying to choose your color green kitchen cabinets? Start here, with this selection of 20 fantastic design ideas. We’ve found some of the best kitchen designs and dissected them to learn the lessons and draw inspiration. It’s loads of fun, so let’s dive into it. Marble walls give the perfect dropback for any color of the cabinets. So there’s no wonder lime green works so well too. Marble makes bright tones make sense as well. The choice is of color well established here. Green walls, teal kitchen cabinets, and marble backsplash make a winning decor combination. The walls and cabinets complement each other well to set a nice theme. And the marble makes a luxurious accent in this modern design click. The earthy tones in this kitchen design are very prominent and complement each other well. The wooden butcher block countertops in a nice stain work so well with the minty-greenish Hardwick White paint color of the cabinets. And we have to love the accent mosaic backsplash. Combining different shades of green can work well in an earthy rustic theme. This kitchen design benefits from the combination of teal and Harlequin green cabinets along with a natural wood ceiling. The lava stone countertops and the hardwood floor work as the perfect anchor for the decor. 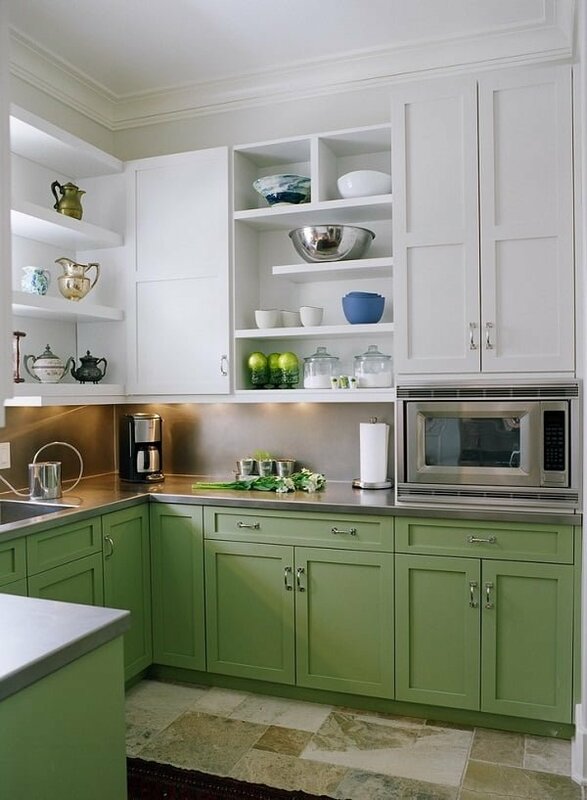 Just a tad of soft green color makes the kitchen cabinets blend into the all-white decor. The cherry butcher block countertops are the accent in this design. And the work so well against the soft backdrop. 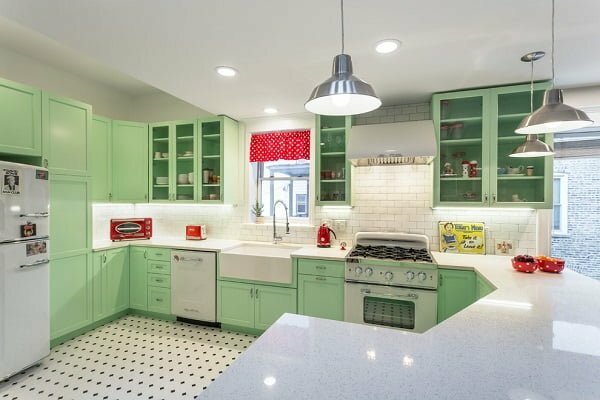 The minty green is so vibrant in this retro style kitchen design. The green kitchen cabinets are contrasted with red polka dot Roman shades and kitchen accessories, and they make a stunning retro effect. We love the choice of subway tile backsplash wall too. 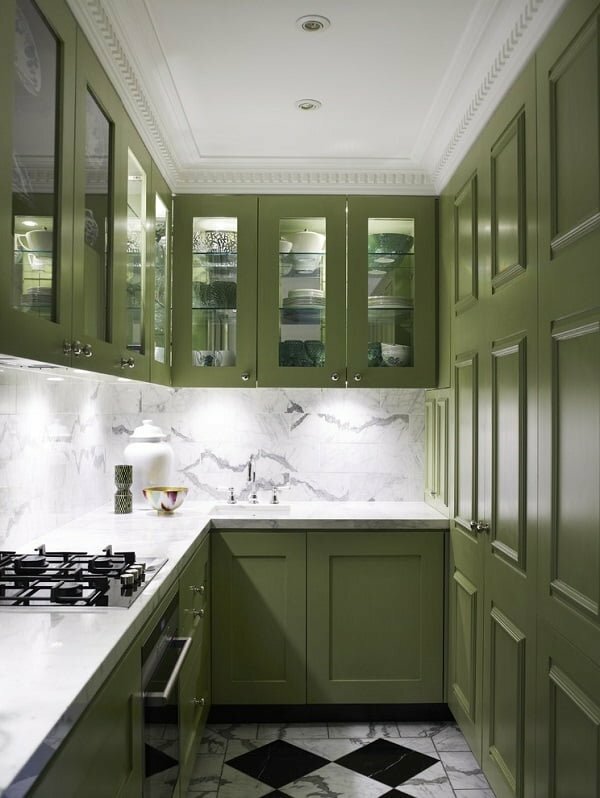 The upper white and lower green kitchen cabinets divide the visual space vertically. This makes room for a lot of accents in open shelves which are well executed in the choice of decor items. It’s a nice transitional kitchen design with a good mix of materials, textures, and color. 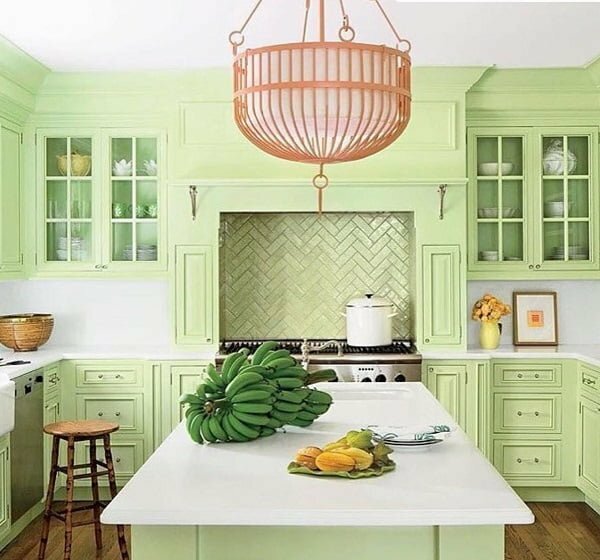 This kitchen design is very fresh and spring green. It’s a brilliant decor decision to have a living space all year round. The choice of Hollingsworth Green kitchen cabinets is subtle and not in-your-face. It’s very earthy and inviting. 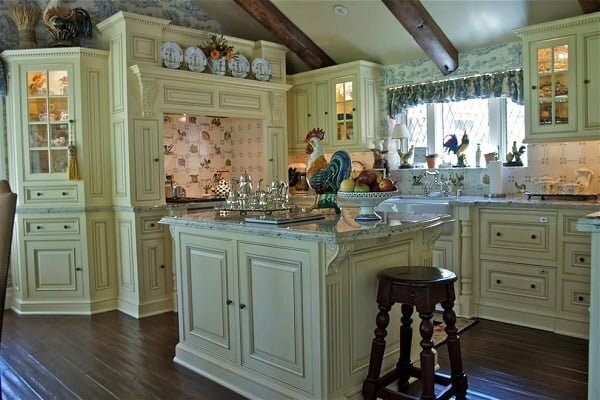 The antique decor theme is a unique choice for the design of this kitchen. And the tone of green cabinets is the right one, in our opinion. 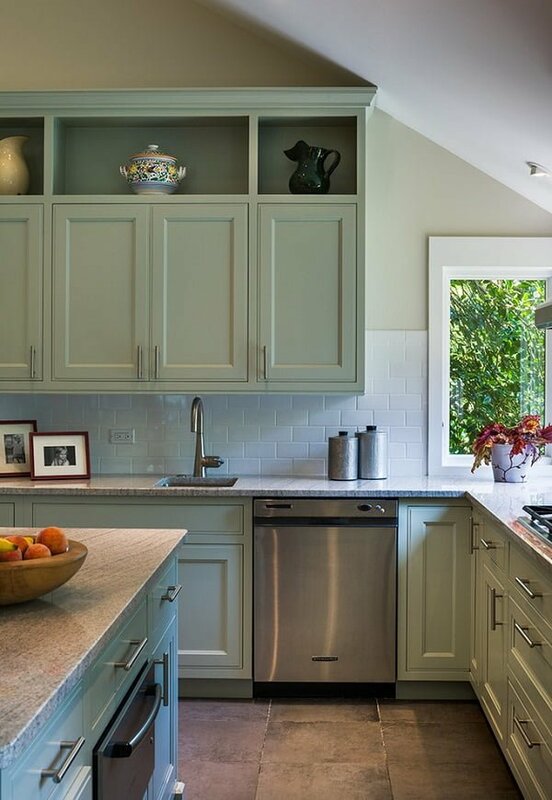 It’s bright and makes the neutral tones of the vintage style appliances stand out. That’s all the beautiful kitchen decor needs. 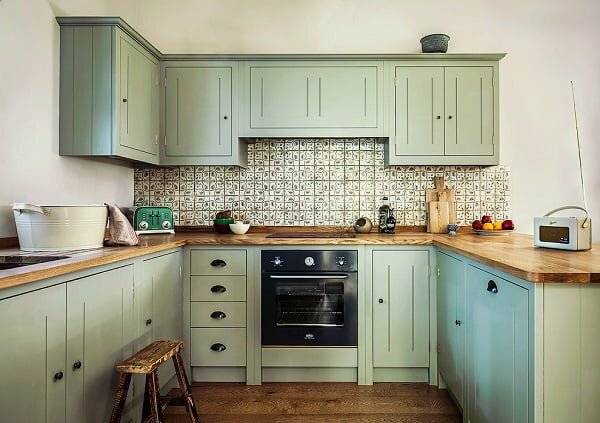 There’s so much decor interest in this eclectic country French kitchen design. The soft green kitchen cabinets are the focal point here. They take the spotlight with beautiful beveled panel doors, crown moldings, and cute embellishments. It’s a gorgeous kitchen design, and you can draw a lot of inspiration from it. 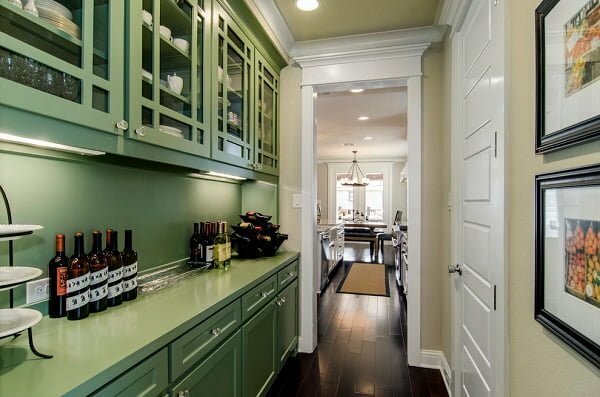 This one wall kitchen in all green cabinets and countertops makes use of color to divide the space nicely. This ensures that this small kitchen space is made visually prominent and appealing. 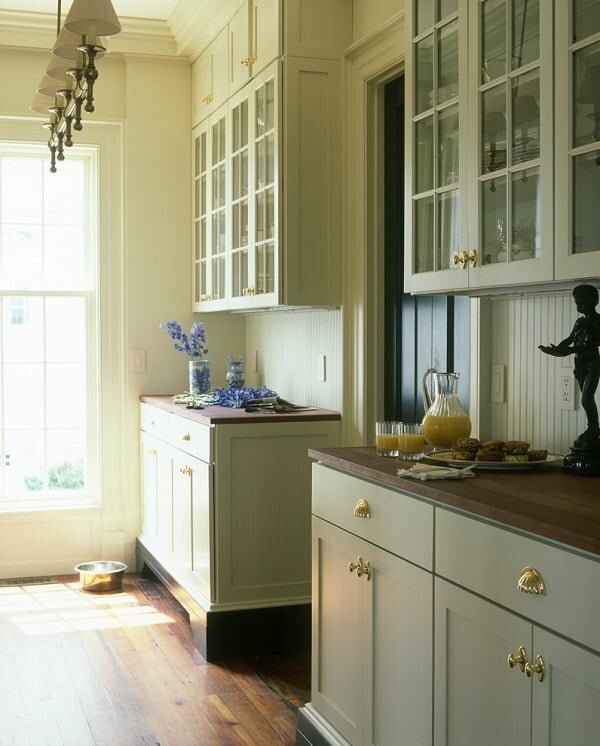 This is a great decor choice as the cabinets are so lovely and deserve to be featured. We also love the crystal door knobs which make a charming accent. 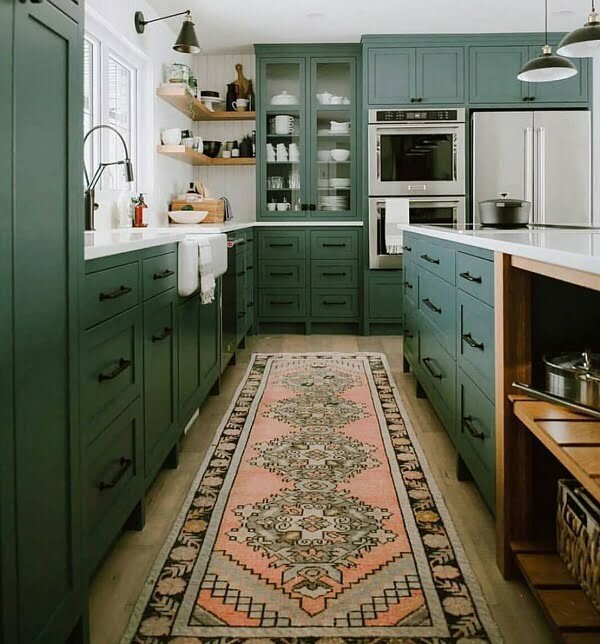 These teal kitchen cabinets are contrasted with an accent pattern runner rug, and it’s a winning combination. It’s an excellent choice of color and pattern which gives the space an inviting appeal. The rustic accents of wooden shelves make the entire design click. 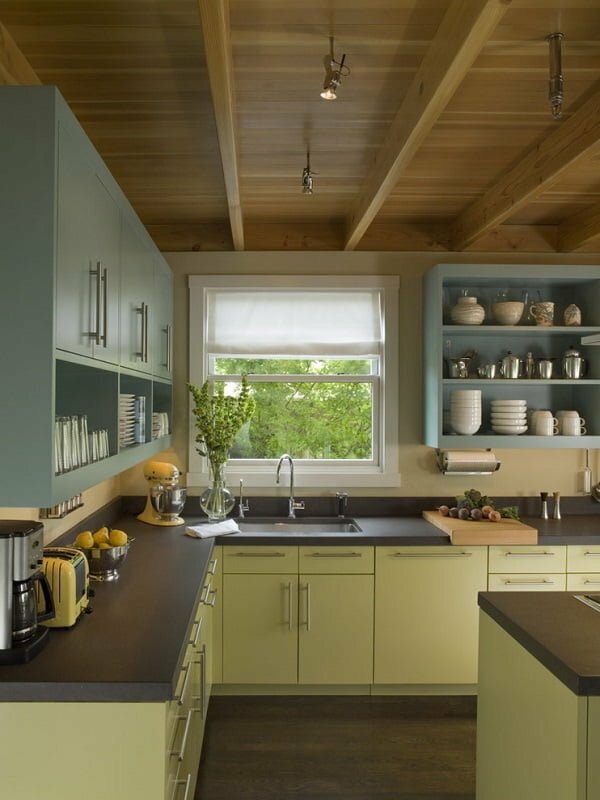 This lovely kitchen features green cabinets as the focal point. The addition of farmhouse accents make the decor cozy and inviting. The bright green color is contrasted with hardwood floor granite countertops. The play of color makes this kitchen a fun place. The dark Hunter green kitchen cabinets make a fantastic backdrop to natural wood and white accents. It’s a well balanced and harmonious combination of color. This is a very inspiring kitchen design with a lot to learn from. 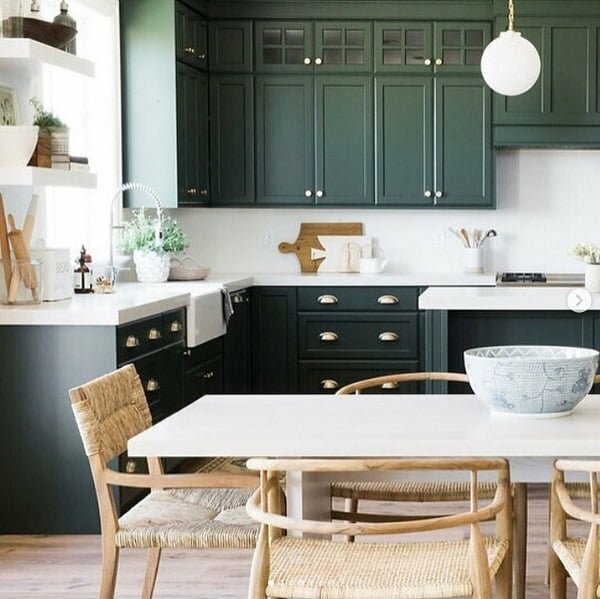 When the kitchen is all-white, a striking jade green color for the kitchen cabinets is all it takes to create an eclectic decor with a lot of character. 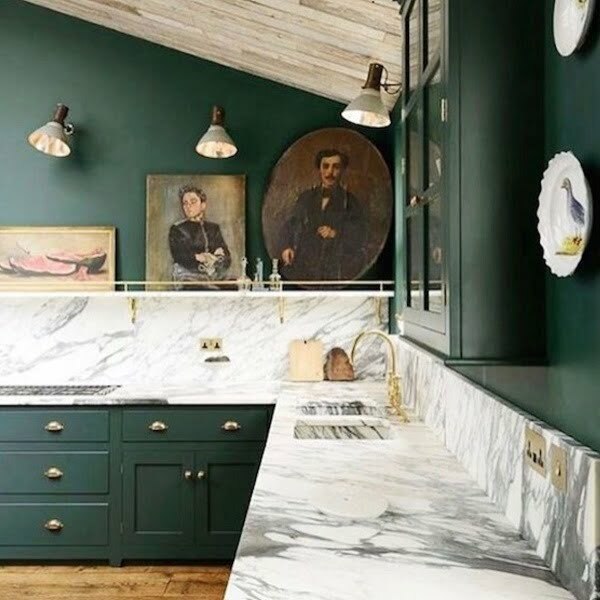 This bold shade of green with a weathered texture creates such a drama in this kitchen design. And we love it! Vintage accents always make a bold statement and add so much character to a decor. Take these Hunter green kitchen cabinets together with marble countertops and gilded metallic accents. Add a few vintage wall art pieces, and you get an eclectic design to die for. This kitchen design is a big seasonal hit when spring comes. 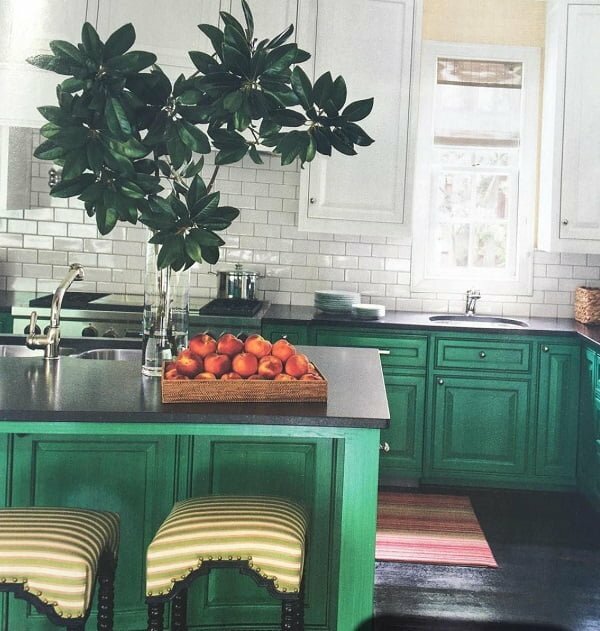 But spring green kitchen cabinets can be used all year round. They make the kitchen vibrant and playful. You would always want to bring fresh greens home in this all-green kitchen. Open space kitchen benefits a lot from the bold choice of color. In this case, the jade green kitchen cabinets make the kitchen stand out in the open floor plan. Space is well divided into the living room, kitchen and dining areas. The bold colors of the cabinets and the rug create a lot of character and drama in this decor. 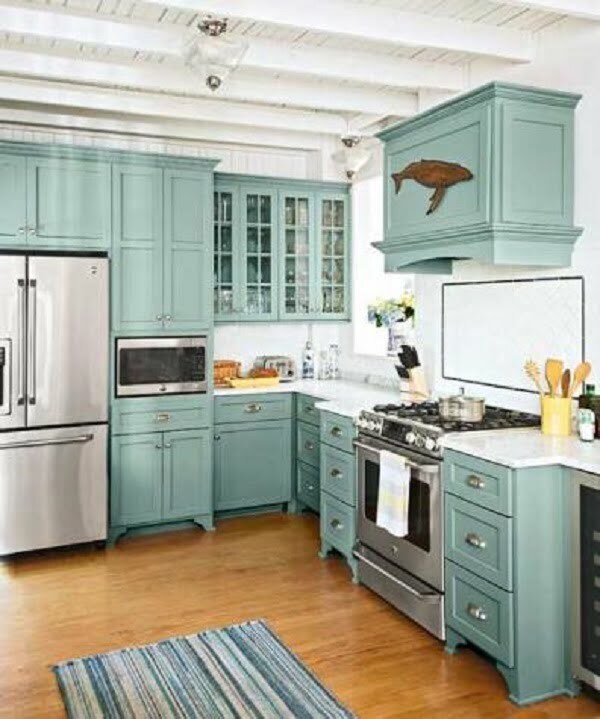 The greenish-blue Benjamin Moore’s Stratton Blue color is the perfect fit for cabinets in this kitchen renovation. They contrast against the white shiplap walls and make a popping accent. That’s all the kitchen needs for the picture-perfect design. This kitchen benefits from rustic weathered green cabinets that compliment the granite countertops and the farmhouse sink. 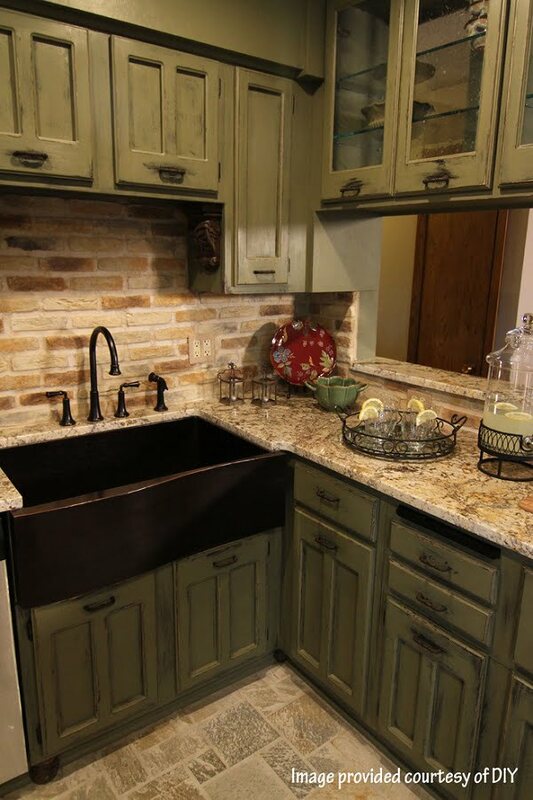 The bronze finish of the sink and the granite texture requires merely the weathered look of the cabinets, and the choice of the green color is so well made.